The Red Sox announced the promotions of a trio of right-handed pitchers on Thursday. Jonathan Aro (pictured) has been added to Triple-A Pawtucket, and Joe Gunkel moves up to take his place on the Double-A Portland roster. The moves are in conjunction with the moves on the major league staff as Robbie Ross Jr. has been recalled to Boston and Justin Masterson placed on the 15-day disabled list. Update: The Red Sox have also promoted right-hander Chandler Shepherd to Salem as part of the chain of promotions. Aro, 24, has been making a fast ascent in the Boston organization over the past two years. After spending a full season each with the DSL Red Sox, GCL Red Sox, and Lowell from 2011 to 2013, Aro will be appearing in his fourth level in less than ten months. In eight appearances out of the Portland bullpen this season, Aro had a 2.28 ERA in 22 1/3 innings, striking out 19 and walking eight. Aro was named a SoxProspects.com All-Star in both 2013 and 2014, and was also honored as South Atlantic League All-Star last season. Gunkel has been dominant since the Red Sox took him in the 18th round of the 2013 draft out of Division II West Chester (PA) University. In 146 2/3 career minor league innings, the 24-year-old sidearmer has a 2.95 ERA with 156 strikeouts and only 31 walks. Gunkel had been serving in a swingman role with High A Salem this season, making two starts and six appearances out of the bullpen. He had allowed six runs (five earned) in 22 innings, striking out 22 against four walks. Shepherd was drafted in the 13th round of the 2014 draft out of the University of Kentucky. He was seen as a potential top pick after an excellent 2013 showing in the Cape Cod League, but suffered a forearm laceration on his pitching arm in 2014 that caused him to miss three weeks of the college season, and led to his being moved into the Kentucky bullpen upon his return. He has been impressive in his short professional career: In 14 2/3 innings this season in Greenville, he has posted a 1.23 ERA striking out 16 while walking three and allowing 16 hits. 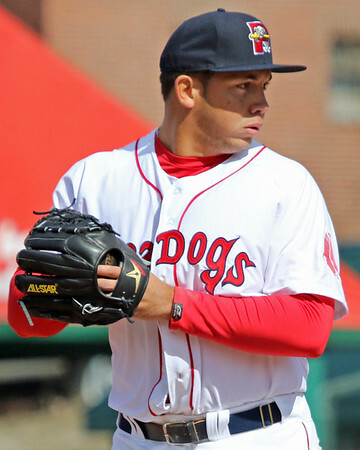 Last year in Lowell, in 33 1/3 innings, he struck out 35 and walked eight, albeit with a less-impressive 4.05 ERA. Recently, SoxProspects.com Executive Editor Chris Hatfield caught a Shepherd outing and was impressed, commenting that Shepherd struck him as "a player that could easily get to Salem this year and could potentially move quickly through the system."